Until recently, weak lensing had been limited to calculating the total mass of relatively nearby groups and clusters of galaxies. Their total mass includes both ordinary, visible matter like stars and dust – what astronomers call “baryonic” matter – plus the much more massive invisible concentrations of dark matter that form groups and clusters by pulling galaxies together. Astronomers were able to establish an important scaling relationship for nearby clusters between their total masses, determined by gravitational lensing, and the brightness of their x-ray emissions, an indication of the mass of the ordinary matter alone. A new study in the Astrophysical Journal (ApJ) now continues this important relationship to distant objects. “We’ve been able to extend measurements of mass to much smaller structures, which existed much earlier in the history of the Universe,” says Alexie Leauthaud, a Chamberlain Fellow in Berkeley Lab’s Physics Division and first author of the ApJ study. “This helps us gain a better understanding of the relationship between the normal matter in dense structures, which are seen through the x-ray luminosity, and the total dark-matter mass of these structures, as measured by the weak lensing.” Leauthaud is a member of the Berkeley Center for Cosmological Physics (BCCP) at UC Berkeley and Berkeley Lab. Gravitational lensing occurs because mass curves the space around it, bending the paths along which rays of light travel: the more mass (and the closer to the center of mass), the more space bends, and the more the image of a distant object is displaced and distorted. Thus measuring distortion, or “shear,” is key to measuring the mass of the lensing object. At least this is so for “strong” lensing. A very massive object or collection of objects, like a nearby galaxy cluster and the invisible dark matter that encloses it, distorts the apparent shape and position of bright objects beyond it so much that the distant images are bent and may even be smeared into rings around the foreground cluster. The visible distortion is a direct measure of the mass of the lens and points to its center. Weak lensing works the same way, except that the shear is too subtle to be seen directly. Most of the apparent shear isn’t distortion at all – a galaxy has its own distinct shape, and we often see it from an angle that makes it look elongated. Apparent shear may also be due to the telescope, the detector, or the atmosphere. 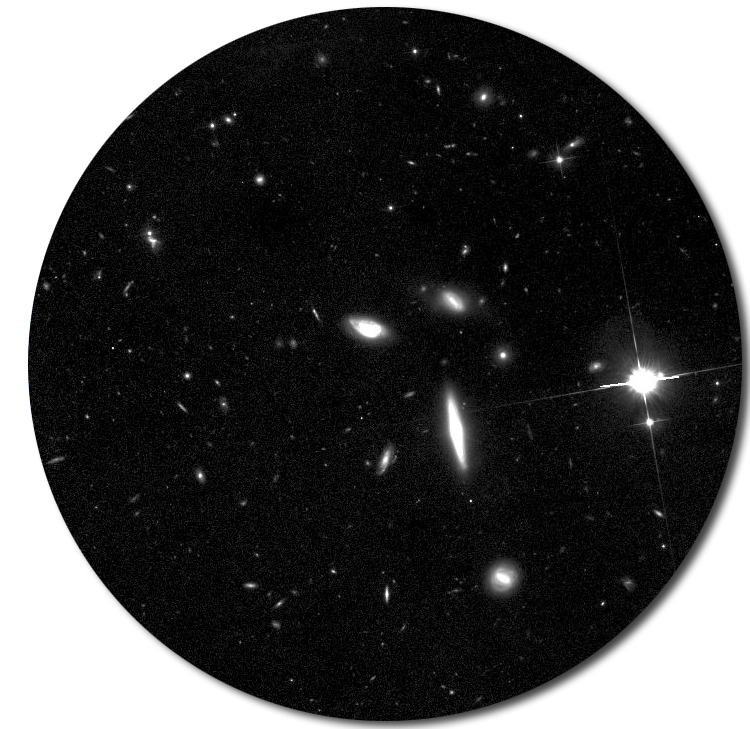 Nevertheless, faint additional distortions in a collection of distant galaxies can be calculated statistically, and the average shear due to the lensing of some massive object in front of them can be computed. Yet to calculate the lens’s mass from average shear, one needs to know its center. The hot intracluster medium of gas or plasma that fills almost all galaxy clusters emits x-rays, making x-ray emission a convenient way to find distant galaxy structures in the night sky. But how does this emission help find the center of mass in a galaxy cluster? For the same reason that dark matter is dark. Except through gravitation, dark matter does not interact (or interacts only very weakly) with itself or with ordinary matter. Indeed, that’s why it’s dark: to emit light it would have to interact via the electromagnetic force. With ordinary matter, electromagnetism affects everything from chemistry to luminosity to electric and magnetic fields and even the pressure of stellar winds; thus electromagnetism plays an important role in determining the arrangement of ordinary matter, which is often irregular. Because electromagnetism plays no role in the distribution of dark matter, however, dark matter forms large, smooth, spherical clumps, usually filled by ordinary galaxies plus hot gas or plasma, which it has trapped and retained solely through gravitation. To pin down the scaling relation between x-ray brightness and total mass, Leauthaud and her colleagues first used x-ray luminosity to identify the center of mass of 206 galaxy groups and clusters, including numerous faint, distant clusters listed in the Hubble Space Telescope’s Cosmic Evolution Survey (COSMOS), which is curated by Nick Scoville of the California Institute of Technology, an author of the ApJ paper. The X-ray analysis itself was performed by Alexis Finoguenov of the Max Planck Institute for Extraterrestrial Physics and the University of Maryland, one of the paper’s lead authors. Knowing the centers of mass from analysis of x-ray emission, the researchers could now use weak lensing to estimate the total mass of the distant groups and clusters with greater accuracy than ever before. The origin of galaxies can be traced back to slight differences in the density of the hot, liquid-like early universe; traces of these differences can still be seen as minute temperature differences in the cosmic microwave background (CMB). One goal in studying the evolution of structure is to understand dark matter itself, and how it interacts with the ordinary matter we can see. Another goal is to learn more about dark energy, the mysterious something that is pushing matter apart and causing the Universe to expand at an accelerating rate. Is dark energy constant, or is it dynamic? Or is it unreal, merely an illusion caused by a limitation in Einstein’s General Theory of Relativity? The tools provided by the extended mass-luminosity relationship will do much to answer these questions about the opposing roles of gravity and dark energy in the once and future shape of the Universe.